I love technology. I’m a sucker the latest, bestest new gadgets that hit the market. In fact, I just bought a new smart phone. I MIGHT have it figured out by the time it’s time for me to upgrade to a new phone. Maybe . . . But even though I love technology, I’m not always as crazy about some of the things that come along with it. For instance, I love to text just as much as the next teenager, but I’m not crazy about all the abbreviations. I’m about sick of all the LOLing and BFFing and IMOing and BTSOOMing. Ahhhhhh. If I only had enough room at home to store THIS MUCH peanut butter. I’d be livin’ the good life! But there is one abbreviation that does still kinda ring true, and that’s OCD. I suppose the fact that I’m all uptight about abbreviations might be a clue. In fact, I’m beginning to think that my OCD is a bit OOC – Out Of Control. I’ve got to admit, I was doing a LOT better on the OCD front. I wasn’t having meltdowns if my sandwich wasn’t cut right. I didn’t lose sleep if my underwear wasn’t folded properly. And I never missed a beat if my plate wasn’t turned just so before I ate. Well, ok, I’m lying on that last one. But I PROMISE I’m doing better on the others. Well, I was, that is, until I was brought down by a simple food staple. Yep, ole Peter Pan got me. It started simply enough. My son was eating a lot of peanut butter. So I would start buying the next jar before we ran out. BUT THEN I found myself buying the new jar ASAP after I finished a jar. Even though I buy the yacht-size jar, I JUST KNEW we would run out quickly if I didn’t buy the next jar. Ok, I guess I can live with OCD in ONE AREA. Unfortunately, my daughter likes CHUNKY PEANUT BUTTER. So . . . then I started having to buy the auxiliary jar AS SOON AS we ate the last morsel of the current jar. 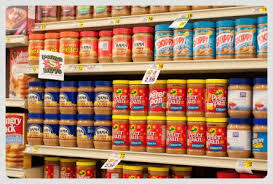 In fact, in the peanut butter arena, I felt an uncontrollable urge to dash to the store RIGHT AWAY, day or night. Maybe that’s not so bad. And maybe it wouldn’t have been either, if it hadn’t been for those darn trash bags. Yep, I soon found myself with a very pressing need to have a second package of trash bags on hand. And I sometimes found it hard to eat if I didn’t have a spare package on hand. Well, maybe not hard to eat, but hard to do some other, less important things, like work, for instance. And other items have been added to the OCD shopping list. Important stuff, like milk, bread, apples, Ding Dongs, Pop Tarts, and yes, even the drinks I put in my son’s lunch everyday. And even and ESPECIALLY the ziplock bags I use to pack items in his lunch. If we should somehow fall under 500 bags . . . well, I don’t EVEN want to tell you what happens. But I really didn’t realize I had a problem . . . until the other day, when I found myself wanting to have a THIRD jar of peanut butter on hand. Ok. So maybe we have a wee little problem here . . . But I swear I’m working on it. I REFUSED to let myself buy that third jar! See? I’m already making progress. Of course, it is Friday, and I may or may not be wearing my Friday underwear. And there’s a good chance at lunch I won’t rotate my plate in ANY direction to have it just right before I start eating. Well, I won’t rotate it IF I set it down right to start with . . .